Change usually usurps the comforts of complacency. 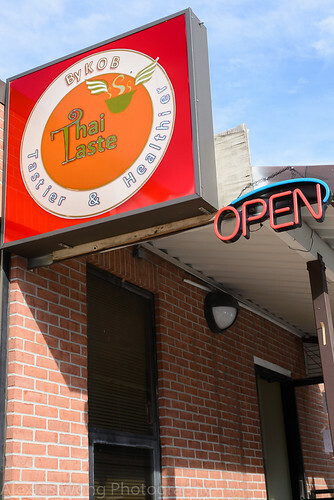 In the last few years, my usual go-to Southeast Asian market and my favorite Thai restaurant were casualties of the recent recession, both located within walking distance from each other in Wheaton, MD. Since then I had been on the search for worthy replacements for both categories. After many months, I found a grocery store carrying many difficult-to-find ingredients, located a stone throw away from the defunct businesses. As I left the location, I noticed a newly opened eatery at the end of the parking lot. Walking in, I asked for a copy of their menu, and after perusing its extensive offerings, I was inspired to pay this eatery quite a number of visits before writing this review. 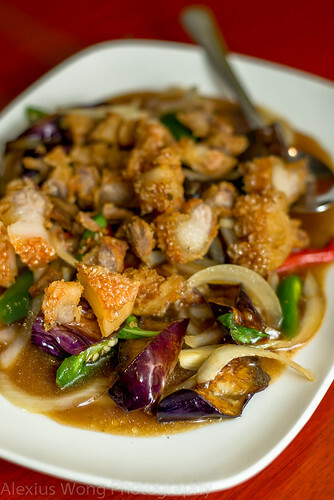 The menu at Thai Taste is a bit of a maze, much like the streets in Bangkok, partly due to the extensive offerings and most dishes listed in the Thai language, in addition to the rather creative and zany English descriptions. After familiarizing myself with the menu while munching on some peppery and savory complementary Fish/Shrimp Crackers (nice touch) reminding me of Grandma’s, I decided to go with a couple of familiar appetizers. I started with the Spicy Seafood Pho Taek. The bowl arrived with pieces of shrimp and squid, bits of bay scallop and a mussel, covered by a clear broth that is akin to Tom Yum with its spicy bite, sour notes from lime juice, fish sauce saltiness, and pungency from root aromatics evidenced by the bits of lemongrass, kafir lime leaves, galangal root, and fragrant basil leaves. What was lacking in the less-than-inspiring bits of seafood was made up by the full-bodied clear soup that woke up all the taste buds. 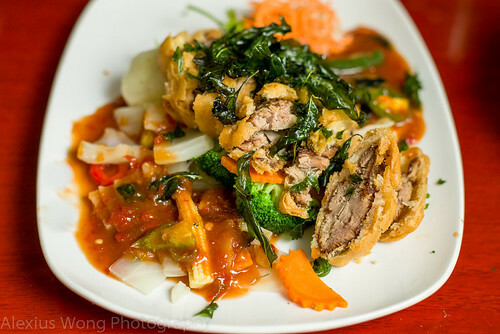 An order of the Thai Taste Crispy Spring Roll was out of the ordinary. Crispy rolls made with an outer shell of rice skin, not the usual wheat flour skin, encased a savory mix of ground chicken, carrot, glass noodles, celery, and a surprising ingredient, taro root, that exuded a smooth sweet note to the whole mix. 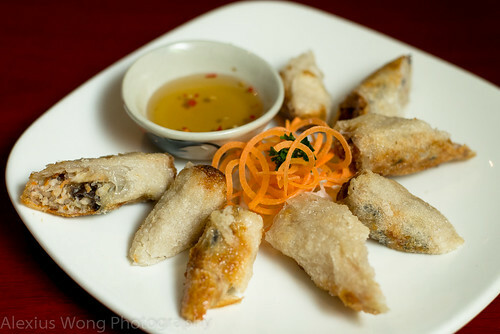 The light dipping sauce, unlike the usual sweet chili sauce, consisting of fish sauce, lime juice, chili, and garlic provided the complementary notes to these tasty bites. Already, one notices a different direction from the usual coming from this Thai kitchen. The menu in this establishment offers many street food dishes, those not usually found in most Thai restaurants. 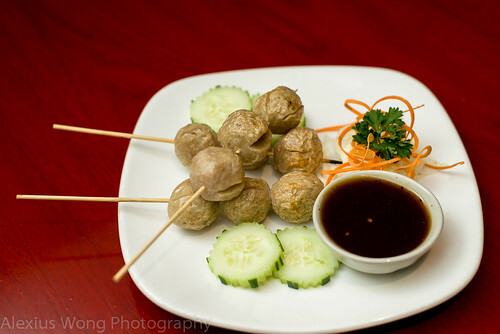 Look Chin Ping is skewered meatballs or fishballs that are grilled or fried, served with a tamarind chili sauce. One bite into it brought me back to the food stalls in front of Cathay movie theater in my homeland during the 70’s. What made the dish work for me was the pepperyness along with the umami-ness that each bit possessed, balanced by the fruity and spicy tamarind dipping sauce. Another opener was Lucky Bags. 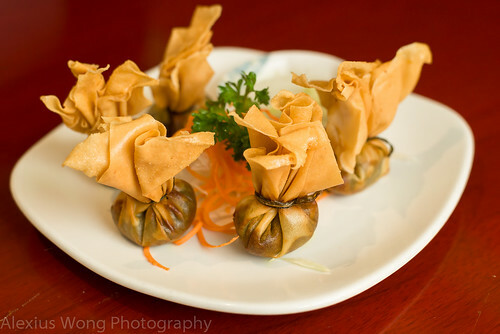 Pouches of ground chicken mixed with sweet potato were seasoned with curry powder and wrapped in spring roll dough. I found the fried bags a bit greasy, given that sweet potato easily absorbs some of the oil, and the mix rather interesting but perhaps missing one more element to make this appetizer successful for me. Another order of Gai Yang peaked my interest. 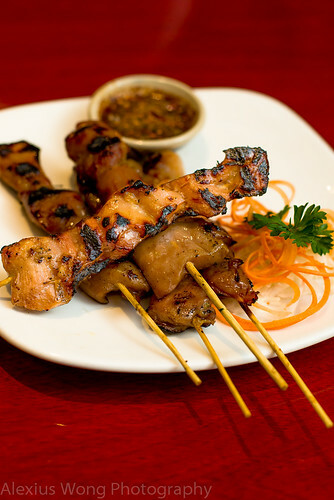 Pieces of skewered chicken thigh meat came well-marinated and grilled with some burnt marks. The seasoning permeated each morsel with slight sweet notes (server wouldn’t divulge the seasoning secret), a bit dry but at least not like breast meat, and complemented by a fiery sour sauce made with lime juice and smoky toasted chili flakes. The meat balls and skewered chicken are definitely street food offerings usually not found in most Thai establishments and they are worth the order here. On a couple of occasions, I tried the salad dishes. 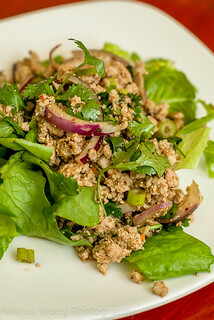 Larb Gai is a standard found in most Thai establishments. My order arrived with a heaping mound of ground chicken sitting on lettuce leaves, along with some slices of red onion and some cilantro. The dish was still warm pointing towards its freshly made nature. After a few bites and despite my appreciation of it coming straight from the wok, the dish proved a bit of a ho-hum due to the lack of punch in the seasoning which usually consists of lime juice, fish sauce, toasted rice powder, and smoked chili flakes; perhaps, the chef forgot to taste this batch, which could have easily been rectified. 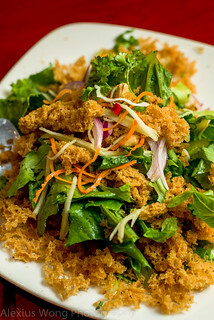 Another day’s order was Yum Pla Duk Foo or Catfish Salad. When the dish arrived, a mound of brown fried lace was sitting on the green elements waiting to be stirred with the side sauce. After mixing it, I was wondering where was the fish element. My server pointed out that the lacy topping was made from finely shaved catfish, which amazed and perplexed me. I thoroughly enjoyed this popular dish here with the different textures and flavors, aided by some nutty peanuts. some sweet julienned green apple, and a well-balanced chili-laced sour and salty sauce that provided the much-needed flavorings and moisture to the whole mix. Thai street food denotes dishes that are quick to prepare and fairly complete in its make up, which noodles make a good medium. 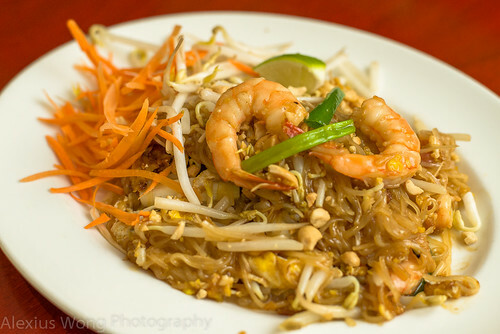 The menu lists the ubiquitous Pad Thai “cooked with a tamarind sauce”. Usually one to avoid this dish which I have found to be pedestrian in most places, the rendition here did not belie its description, being made with the faintly clove-scented fruity tamarind, sweetened with slight molasses-like palm sugar, and the saltiness from fish sauce. I could not believe that I was inspired by this dish that I pretty much wrote off some time ago due to poorly made versions made with vinegar and sugar; never mind the smaller lunch portion since it was satisfyingly compensated by the wonderfully seasoned and bouncy noodles. Another lunch order was a favorite of mine: Pad Kee Mao or Drunken Noodle. My dish arrived with some very fresh noodles judging by its slightly firm “bounce” moistened by a slightly sweeter than usual sauce, and studded with bits of different seafood and fishballs cooked with some cherry tomatoes and sweet peppers. I truly enjoyed this plateful which was hitting the right spots including the chili heat and fragrant basil leaves. A lunch order on another visit was Bangkok Noodles. 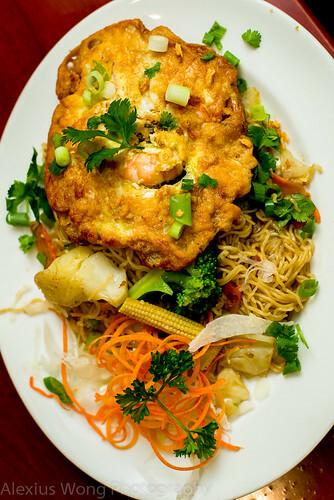 A plate arrived with a melange of egg noodles, cooked vegetables, and a shrimp and crabmeat omelette a la Egg Foo Yong. It was a bit sloppy but street food is not meant to be overly refined. What I appreciated in this dish was the well-sauced egg noodles and the omelette despite me not being able to discern the crabmeat in the egg mixture. But I could imagine someone ordering this noodle dish from a street vendor as part of his daily meal after a hard day’s work. From the section on noodles with gravy/soup, my server highly recommended Chiang Mai Noodles. 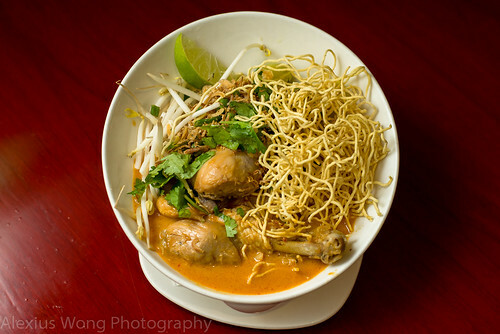 The slanted bowl arrived with disparate elements ready to be mixed together: boiled egg noodles, crispy fried noodles, beansprouts, fried shallots, cilantro, a slice of lime, and chicken drumsticks, all sitting on a pool of chicken curry. After giving everything a good stir and a squeeze of lime, I took my first bite. Wow! The flavor in the curry sauce was the perfect agent to amalgamate the different textures and flavor elements, exuding its spiciness, rich coconut cream base, and a tinge of sweetness, reminding me of Southern Thai Massaman curry. The pieces of chicken had the curry flavors permeating through the flesh, along with the fall-of-the-bone quality that made them irresistible – I think I just found a new noodle favorite with this discovery. 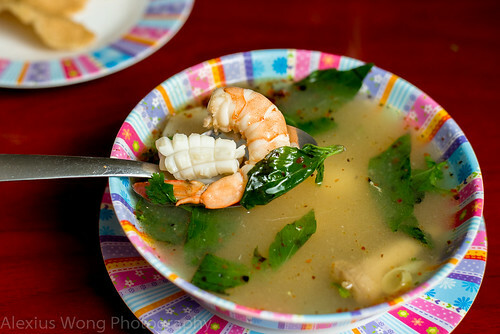 An order on another occasion was Nam Tok Moo or Floating Market Noodle Soup. 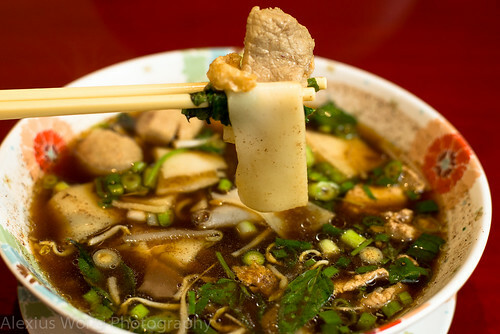 A bowl of wide rice noodle filled with a dark soup was accompanied by fresh herbs, beansprouts, and pork crackling. The saying is that the broth in a noodle soup makes the dish, and this bowl was no exception with its aromatic and rich soup supported by lean pork, bouncy noodles, fragrant basil leaves, green onions, and the irresistible crackling that took each spoonful to gastronomic stratosphere. A final order of Ka Nom Chine was unchartered territory for me. My server brought the deconstructed elements in a separate plate accompanied by a bowl of fish and fishball curry. After assembling my plate with the wheat/cornstarch noodles, green beans, carrot strands, beansprouts, pickled mustard green, and a boiled egg, I slathered the combination with the curry. 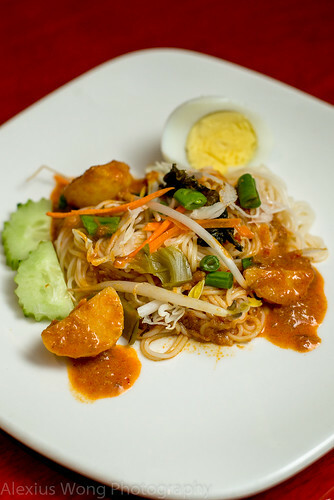 I have to admit that my mind and tongue had a bit of a hard time wrapping themselves around this new dish with the cold noodles and raw elements trying to find marriage with the hot spicy curry. But I quickly fell for the curry with the fish flesh finely shredded in the fiery gravy exuding strong notes of kafir lime leaf and Thai rhizome. A couple of spicy main dishes made up dinner on a visit. The first was Thai Taste Duck and Crispy Basil. The dish arrived looking a bit sloppy with sliced battered duck pieces topped with a copious amount of deep-fried basil, along with some boiled vegetables under a blanket of sweet and spicy sauce. Never mind the lack of finesse in this dish; what made it up was the duck that impressed me with the five-spice powder aroma permeating the fairly moist dark meat, coated by a well-seasoned light and nearly grease-less crispy batter that tempted me to eat every morsel of its crunchy goodness (I can’t – on a mini diet here). 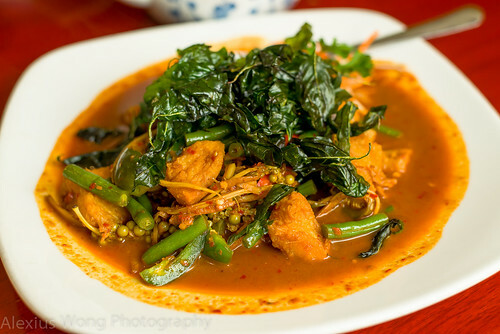 The other dish was Pad Ped Pla Duk or Spicy Fried Catfish. My dining companion decided to order it ped or spicy, and one bite into his dish, he broke out into a sweat. Beyond the spicy heat, I could discern the sauce that was replete with root aromatics, further made flavorful with green peppercorns and Thai rhizome that lent its je-ne-sais-quoi appealing element. The pieces of catfish were crispy on the outside but still moist and clean-flavored inside. Sorry buddy, Ped in the title means no compromise in its spice level, at least not in this kitchen. 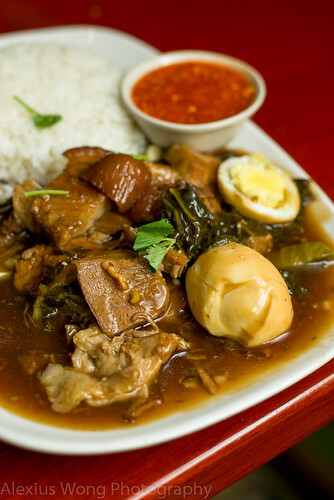 Another order of Kao Ka Moo comprised of pork leg stewed in a dark aromatic sauce. Yes, there was quite a bit of fat with each piece of meat, but that comes with the territory with this cut of meat. The pieces were extremely tender after being cooked in the mouth sticky broth tasting of five-spice powder with pieces of pickled mustard green. Again, this dish pointed towards its origin either from the home kitchen or street vendor. The side chili sauce was the perfect spicy acid relief with its fresh chili notes mixed with some garlic, vinegar, and ginger – I could have eaten the whole amount if weren’t for the chili heat. Not all Thai offerings are on the singe-the-tongue level. A few mild ones on the menu were quite memorable. Pad Khing is a stir fry that consists of onions, mushroom, carrot, green onions, Chinese fungus, green chilies, red bell pepper, along the choice of meat or seafood. The version here was a savory one with a full-bodied sauce spiked with some young ginger that added quite a bit of bite to each mouthful. 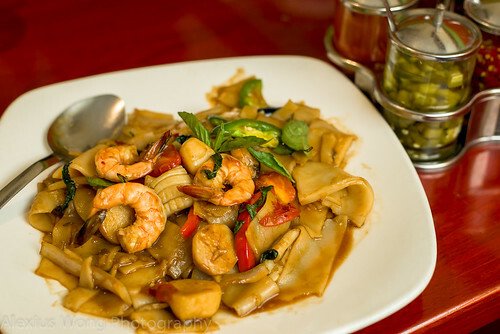 Another dish worth considering is Pad Ma Kuea. Pieces of Chinese eggplant were perfectly cooked, without being mushy, along with onion, green chili, red bell pepper and basil leaves, moistened by a savory bean sauce. This mixture was very appealing due to the skillful cooking and wonderful sauce, made even more luscious by the pieces of crispy belly pork that was the choice protein of my dining companion. This dish hit all the notes for my friend especially the crispy pork for which he has a strong penchant. Enough of the savories – time for the sweets. 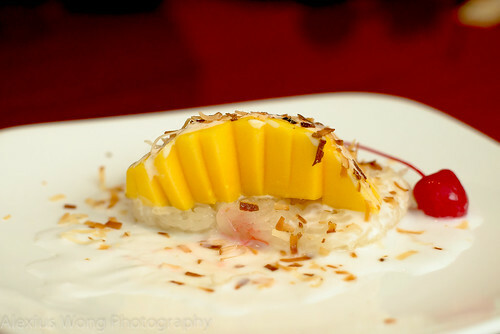 A must-order, and a litmus test for a Thai eatery, is Mango Sticky Rice. The glutinous rice was fragrant and rich from the use of coconut cream in the steaming process, nearly as good as my favorite rendition from another Thai establishment. However, since it was not peak season for mango, as the fruit was not soft and it lacked the necessary sweetness to match the rich grains. The sprinkling of toasted coconut on top added more of the nutty notes, although I felt the dish could have done without this extra element. The other sweet offering was Taro Custard. 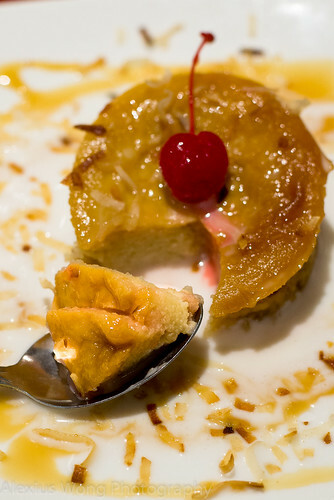 The small cake was creamy rich and slightly nutty from the use of coconut cream, with a soft mash potato-like texture that spoke of the taro root used in the mix. I love this stuff and the version here was not short in any of the categories – a wonderful (slightly) sweet ending indeed. 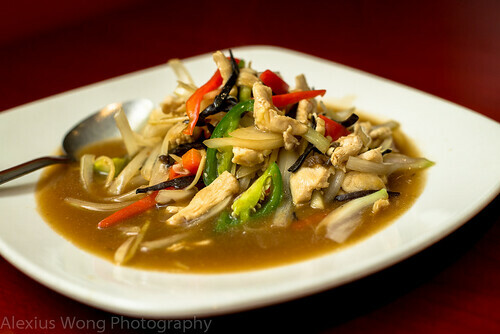 Whew, that was quite an extensive menu and I had to pay many trips to Thai Taste to get a good feel of its kitchen. It is a small place with only 11 tables available with only a small window for natural light. The place does get quite loud with Thai pop music pumping through the sound system, but the ambience is only befitting of the street food dishes on its menu. What the restaurant impressed me most besides the breadth of the menu, were the consistently well-executed and well-seasoned dishes, in addition to the uncompromising quality evidenced by the chili heat levels and the authentic use of ingredients (tamarind, pickled mustard green) which some shy away from. 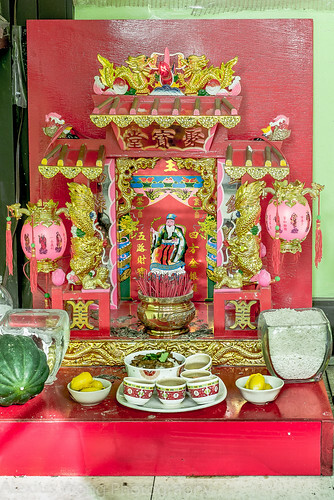 What also makes this establishment stand out from its peers (one located just next door and the other across the road) besides the above, is the unique offerings that would whisk anyone away to that Southeast Asian environment renown for its alluring cuisine. No surprise that I could hear the Thai language coming out from most customers’ mouth, this being a reassuring note for this reviewer and gourmand. Yes, with a number of Thai restaurants around the area and a few already on my blog site, this place was well worth writing about, and it sits very high on my list as of today.